A Champagne bucket is one of the more useful wine accessories to have available. When serving wine at a wine tasting or dinner you often need a way to keep wines at the proper temperature. Walking back and forth to the refrigerator is a pain. An ice bucket helps to keep your bottles cool right at the table. 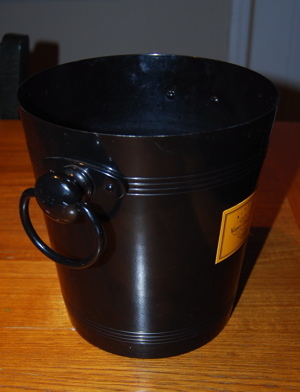 What is a Champagne bucket? Just as the name implies, it is a bucket used for chilling bottles of wine. It is typically filled part way with water and abundant ice, which keeps the water bath at close to freezing (32° F). There are all types of wine chilling buckets, from cheap plastic ones to fancy metal and even crystal ones. Most can be set anywhere on a table or other flat surface such as the one pictured here. However, some are made with a build in stand so that it can sit next to the table and not take up table space. Why use a wine chilling bucket? It is important to serve your wines, particularly white wines and sparkling wines like Champagne at the proper wine temperature to show best at your wine tasting. A bucket filled with ice water is very effective at chilling a bottle quickly and easily. Additionally, it is easy and convenient because it is right by you at the table so you don't have to make multiple trips to the kitchen. How do you use an ice bucket to chill wine? For wines that should be kept very cool for service, you simply leave the bottle in the bucket at all times. Bottles will chill very quickly once submerged in the ice water. For wines that just need a slight chill you can put the bottle in the ice water for a few minutes at a time periodically to keep the temperature down but not too low. Alternatively, you can just keep cool water without ice in the bucket to keep your wines only slightly chilled. For more information on serving wine at the proper temperature, see our Wine Temperature page. Done learning about the Champagne Bucket?